When humans walk, whether barefoot or otherwise, an initial heel contact when stepping is the normal, natural gait. This is often referred to as walking with a heel strike, and is what the human foot is designed to do. The term “heel strike” is a little misleading, however, because it tends to bring to mind a hard hit – like striking with a hammer – which is not really what happens, especially if barefoot. Someone wearing shoes or boots with hard heels could certainly make a hard hit or strike downward with their heel if they were so inclined. But about the only time you might actually see that is at a military parade when an army marches in formation, with heels striking heavily on each step in unison. The word “strike” can have many meanings, depending on context. For example, a strike in baseball is not a hit either. In the context of human gait, strike is the standard terminology in the scientific and medical world to refer only to the part of the foot making the initial contact with the ground or other surface, not the force of that contact. That’s why I usually refer to the normal first contact point of a human step as an initial heel contact, not a heel strike. But throughout this article, I may use either terminology. When someone is walking barefoot, as a rule their heels don’t really strike the surface with each step – as in hard hit. They simply touch down and make the initial contact. That is followed immediately by a rolling of the foot forward from the heel to the ball of the foot and then the toes, as the body weight is transferred forward from heel to toes. You might wonder, why am I stating the obvious? Doesn’t everybody walk like that? Actually, they pretty much do. Personally, in real life I’ve never seen anyone not walk like that, and I’m particularly referring to someone walking barefoot on relatively smooth, relatively level surfaces. 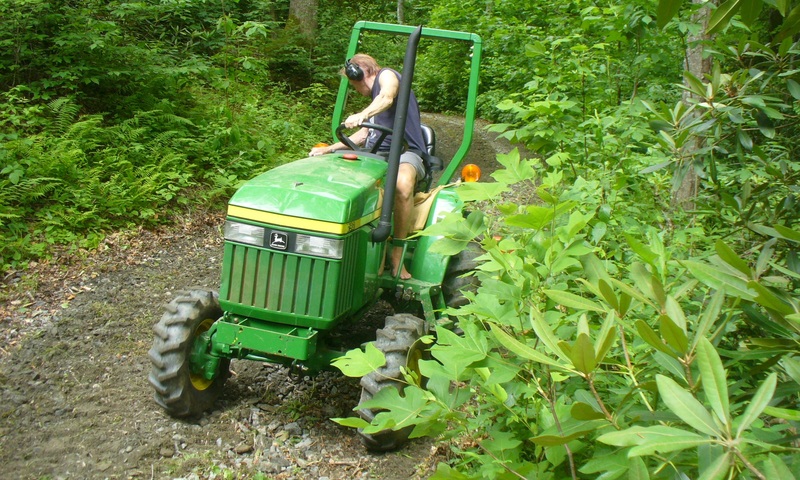 Very rough or very steep surfaces often require a variation in the part of the foot that makes initial contact, for both stability and comfort. Unfortunately, there are a number of videos and articles on the internet and other sources where the narrator or writer claims that when walking barefoot you should never heel strike. This is erroneous and misleading information. An initial heel contact when stepping is a normal, natural gait. It’s the way the human foot is designed. Many animals do walk on their forefeet or toes. But we are humans. Humans walk on two feet, not four, and their feet are designed in a plantigrade configuration, which has a heel that functions as the beginning point for a normal step. This is further substantiated by observing the walking gaits of remote indigenous tribes that have never worn shoes in their lives. On relatively smooth ground, they always walk with an initial heel contact. Usually there are several reasons or justifications cited by these self-styled barefoot walking “experts” who tell us we’re walking wrong. One thing often claimed is that the only reason humans walk with a heel strike is because of having worn shoes since early in their lives, the implication being that otherwise they would walk differently and make no initial heel contact at all. That’s a popular hypothesis, but there’s simply no validity to it. The fact is, the opposite of that is true. Shoes tend to prevent people from walking with a natural heel strike (initial heel contact). Though it may appear, as well as sound, like a strong heel strike is taking place when wearing shoes, that is because of the usual built-up heels on shoes – some higher than others. The foot is trying to come down to a normal gentle heel strike with each step, but the heel of the shoe gets in the way, causing the heel of the foot, while enclosed in the shoe, to strike in a position above where it should be when stepping. Shoes actually tend to force the foot into more of an unnatural forefoot landing, with the heel of the foot higher than its natural position with each step. That situation is described in detail in the 1999 article in Podiatry Management by the late Dr. William Rossi, entitled “Why Shoes Make ‘Normal’ Gait Impossible.” Normal gait, as is made clear in the article, refers to a normal heel initial contact where the heel comes all the way down to the surface. Under these conditions [wearing shoes with standard heels] the step sequence is no longer heel-to-ball-to-toes and push-off, as with the bare foot. On heels two or more inches in height little weight is borne by the heel of the foot, and step push-off is almost wholly from the ball. Another thing often claimed by these folks is that human beings in remote indigenous tribes around the world who have never worn shoes in their lives always walk with an initial forefoot contact, not a heel contact – which supposedly backs up their shoes causing the heel strike hypothesis. Again, false information which can be easily debunked by a little research or even personal observation if you have the opportunity. I myself have visited Fiji and French Polynesia (Tahiti and Moorea) where most native people have grown up never wearing shoes and many still don’t, especially out in the rural areas. They all walk barefoot with an initial heel contact on relatively flat ground. I never saw an initial forefoot contact at all while I was there. Over the years, many good documentaries have been produced showing life among indigenous tribes that still exist in certain remote parts of the world. Scenes in these documentaries showing close-ups of the feet of the people as they walk around are sometimes difficult to find, but they do exist. Where these scenes are found, I have never seen one where anyone in these remote, practically naked, tribes that didn’t walk in the normal human way – that is, with an initial heel contact and followed by a roll of the foot forward to the front part of the foot. Here are a just couple of examples on YouTube. The Shompen are an indigenous people of the Great Nicobar Island, part of the Indian union territory of Andaman and Nicobar Islands, a group of islands south of India where the Bay of Bengal joins the Andaman Sea. You can see a little natural barefoot walking at about 4:12, and a lot of walking at 4:43. The Zo’é tribe lives in the Amazon rainforest in Brazil. You can see them walking barefoot starting at about 30:26. These are just two examples of a number of documentaries available that clearly confirm that people who have never worn shoes in their lives always walk with heel contact first on smooth surfaces – not forefoot or ball first. That is surely proof of the true natural way to walk barefoot. The footprints also show that the gait of these early humans was “heel-strike” (the heel of the foot hits first) followed by “toe-off” (the toes push off at the end of the stride)—the way modern humans walk. Claims are also made that in the Middle Ages, when shoes consisted of mainly just soft leather wrappings around the feet, humans had to have walked with a forefoot strike, not a heel strike, because those soft shoes had no heels at all. This is another conclusion based on the erroneous reasoning that shoes with heels have somehow been the only reason humans currently walk with a heel strike. For example, a couple of years ago an interesting video came out on YouTube that caught the attention of many barefooters. It was a man dressed up in medieval garb inside a German historical park giving a presentation entitled, in part, “Walk Medieval.” He claimed and attempted to demonstrate how people supposedly walked in the Middle Ages in those soft shoes, that is, never making a heel strike as they stepped. His “proof” was a few drawings from those times, some of which showed people in various poses with one foot or the other touching the ground with the ball of their foot. But none of those depicted anyone actually walking. He backed up that conclusion with the other familiar false statement that people of the earth who have never worn shoes their whole lives all step like that when they walk. So, just because medieval people wore soft leather shoes with no heels is no reason to assume they walked much different from how people walk today. Though of course soft shoes with no heels would feel much more like being barefoot, so the gait was probably somewhat gentler than with rigid shoes – but still with a natural heel initial contact. This video narrator’s demonstration of forefoot strike walking vs. heel strike walking was actually somewhat comical, and made me think of the Monty Python “Silly Walk” skits. Another reason often given as to why humans should never walk with a heel strike is that, since most animals don’t touch their heels when walking, we shouldn’t either. They point out that most animals, such as dogs, cats, foxes, etc., only walk on their toes or the forefoot of their paws, never touching their heel down, so it would be only “natural” for humans to walk the same way. Proponents of this theory sometimes call this “fox walking,” and imply that humans should strive for this gait. Unfortunately, they ignore the fact that human feet and animal feet are designed quite differently, and human feet were never designed to walk like that. This natural gait of a human being follows the basic plantigrade design of the human foot. It involves using the whole foot – heel to toes – when walking, as opposed to the digitigrade foot design of the many animals that walk touching only the front part of their feet. Another reason sometimes claimed to justify never heel striking – and this is probably about the most ridiculous one – is that babies and toddlers just learning to walk represent the ideal and natural way to walk, and that we as adults should emulate that type of step as we walk. No, they don’t exactly heel strike as they step. But are we seriously supposed to walk like babies? Babies and toddlers when learning to walk are basically just trying to keep from falling down, as they awkwardly move their feet around. They have very little strength and control of their legs or feet, and only rudimentary stability and balance. The tentative actions of babies and young children as they grow and learn to walk are no different from their process of learning to eat or talk. Surely no one would say we should eat or talk the same as young children as well. It’s a pretty silly notion, comparing infants walking with adults and claiming infants do it the right way and adults don’t. There’s one other little argument I’ve also heard from a couple of people that I should mention, that walking with an initial heel contact somehow causes them to feel a jarring sensation or shock as they step. I’ve never felt anything like that at all. And I wondered why. So I did an experiment a while back. I walked back and forth for several minutes on the hardwood floor in my home, carefully observing and analyzing how I was stepping. This is what I found. On each step, the moment the heel of the foot in front is about to make its initial touch down to the floor, almost all my body weight at that very instant is still on the other foot (the foot in back). Immediately upon touching down with the heel, my weight smoothly shifts forward from the back foot to the front foot, as my front foot continues to drop down gently from only heel contact to full foot sole contact. Simultaneously, the heel of my back foot lifts up as that foot rolls up onto the ball of the foot. Then as I lift the back foot off the floor to begin bringing it forward to make the next step, my weight has now totally shifted to the front foot where it remains until the other foot has finished coming forward and begins making contact with the floor – heel first – and the process begins all over. And this continuous smooth motion is repeated for the next step. No jarring or shock of my heel making initial contact (heel strike), but just a gentle touch down and roll forward. I made a short video a couple of years ago showing me walking barefoot near my home, which is currently posted on YouTube. In contrast to the natural smooth heel to toe gait that I usually walk, I have personally noticed that when I have walked with an initial forefoot contact, there is more direct pressure on my knees. One of my knees was injured many years ago during martial arts practice, and three separate surgeries over the years helped a little but never made it normal again. Most of the time, I have no problem walking or doing other normal activities using that knee, but any unusual pressure or strain often causes pain. So, that’s one thing I always notice if I walk with an initial forefoot contact for any length of time, discomfort or pain in that knee due to the more direct downward pressure of my weight as I step. If I feel that discomfort or pain in my much more sensitive bad knee when stepping with a forefoot initial contact, that type of gait must surely be doing incremental damage to my good knee as well. And is most likely damaging anyone’s knees over time if they consistently walk like that. Where did this notion come from that heel striking is a bad thing? So where did this misguided notion come from that barefooters are supposed to never heel strike and should always walk with a forefoot initial contact? That’s not exactly clear, but one theory is that these self-styled “experts” who make this claim are probably not really long-time or full-time barefooters, and their feet are relatively tender. Also, they probably never go barefoot on flat smooth surfaces of the ground, floors, urban sidewalks, or streets. Almost all of these types of videos and articles you see are talking about being outside in nature, such as on hikes. Most hiking trails, or other areas away from urban areas are generally pretty rough, with rocks, gravel, roots, and various things that could be very uncomfortable for the tender sole of a relative beginner. The fact is, if your feet aren’t well conditioned, the most comfortable way to walk on very rough ground with gravel, etc., is indeed to let your forefoot touch down first, and thus more easily absorb – kind of wrap around – any rough or sharp rocks you might be stepping on. It’s not the most efficient or natural way to walk – based on how the human foot is designed – but in those circumstances, it’s probably the most comfortable for tenderfooted beginners. Another factor that may play into that misleading view of barefoot walking gaits is the increased interest in barefoot running in the last several years. Research and experience have shown that a forefoot landing in running is the most natural and efficient, and does the least damage to the body. Some may have therefore postulated that a forefoot landing in walking is also the most natural and efficient. But running and walking are totally different methods to move the body forward. When running, between each step, both feet are totally off the ground for a split second. In effect, you are momentarily floating through the air as you sort of hop from one foot to the other. So landing (or striking) on the heel with each step is the least efficient, least comfortable, and potentially most damaging to the body when running. When walking, one foot or the other is always in contact with the ground. It’s not at all like the hopping motion as in running, but a smooth sort of rolling motion beginning at the heel of one foot as the weight of the body moves forward from an initial heel contact (strike) to the forefoot and toes. As the weight of the body reaches the forefoot and toes, almost simultaneously the other foot is beginning its touchdown (strike) on the heel to repeat the process. 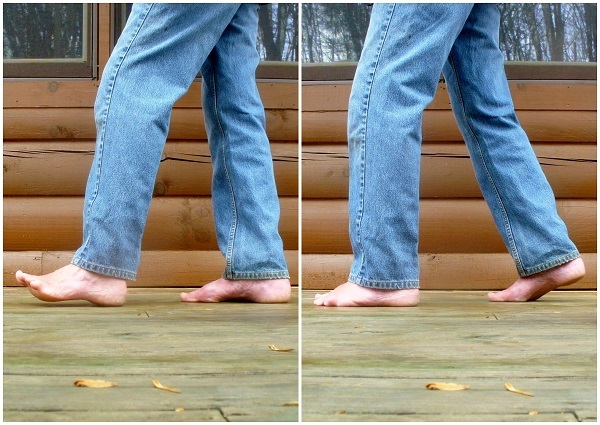 One thing I’ve noticed over the years when I’ve been involved in discussions about barefoot walking gaits, is that most people don’t even know for sure or are confused about how they actually walk. I’ve read some barefooters stating that they never heel strike when they walk, always land of their forefoot first. But in several of those cases, those same people later posted videos of themselves walking barefoot, and it was perfectly clear that they were not walking like they thought they walked or claimed they walked. The only reason this issue (heel strike vs. forefoot strike) has always concerned me is that I’ve seen so many times new barefooters being advised to never heel strike. So, not knowing any better, they attempt to change their natural barefoot gait, and become discouraged because it feels so awkward and unnatural for them to try to walk that way. I have been a barefooter all my life as much as possible – and full-time, 24/7, beginning in 2003. As a child I was always barefoot during warm weather and when not in school. In the military I had to wear shoes when on duty, and throughout my working career I had to wear shoes during working hours. But every chance outside of those situations, I was usually barefoot. I began barefoot running (that was back when practically nobody ran barefoot), as well as I got into martial arts (judo and taekwondo), an activity always done barefoot. Bottom line, nobody ever told me how to walk barefoot. I just walked barefoot from my very earliest childhood and never gave it a second thought how I was stepping. In 2003, I discovered the Society for Barefoot Living and joined it. Along about that time, I began reading and hearing discussions about the “correct” way to walk barefoot. Some people, and some videos and blogs, were saying we should never heel strike, that we should always walk barefoot with an initial forefoot strike, not heel. I started thinking, “Have I been walking barefoot wrong my whole life?” So, I began attempting to walk in the way these so-called “experts” were telling me I was supposed to walk. I found it very awkward and uncomfortable. And it just didn’t make much sense either – my feet just didn’t function like that without a special effort to force them to step that way. So I began to do a lot of research and personal observation. Either I had been walking wrong all along or those that were telling me that were wrong. Based on everything I read, observed, and my own personal experience, I finally came to the conclusion that human feet were never meant to walk in the way these “experts” were trying to tell us we were supposed to walk barefoot. An initial heel touch when stepping is a normal, natural gait. It’s the way the human foot is designed. With that said, however, we should also keep in mind that the human foot is very versatile and was not necessarily meant to always walk or make initial contact with the surface in exactly the same way at all times or on all surfaces or conditions. The foot is designed for and capable of making subtle adjustments to accommodate varying surfaces. That means that using other areas of the foot to make initial contact when stepping may be the most stable, as well as comfortable at various times. I personally step with my heel touching down first on any flat, smooth surface, like relatively level ground, a floor, or level street or sidewalk. On rough, gravelly surfaces or on a steep downhill grade, I step with my forefoot touching down first – it’s just more comfortable – so I give up a little efficiency for comfort in those circumstances. Of course, anyone who prefers to walk forefoot touch first at all times and everywhere should do what they feel is best for their own feet or own situation. It’s a matter of personal choice. But to say that people are supposed to walk barefoot that way is making a false statement. Really, all anybody needs to do, even brand new barefooters, is just walk, and not even think about it. You’ll automatically be walking correctly, because that’s the way the body works – initial heel touch down (heel strike) with each step, with a roll forward of the weight to the front of the foot as the other foot comes forward for the next step. It’s not rocket science. Walking any other way, just because somebody says you should or you’re supposed to, is unnatural, inefficient, and potentially harmful to the knees and other joints. Thanks for the really interesting article. I’m always barefoot around my house and garden but hate going for walks it’s just too uncomfortable. I do it but hate it. After reading your article I think it must be my over protective shoes. What is the criteria for a ‘barefoot ‘ type shoe. Not really keen about walking barefoot on the pavements. Thanks for your comment, Debra. It is indeed your protective shoes that cause your barefoot walks to be uncomfortable. They have caused your feet, particularly your soles, to become thin and soft. Just like building strength and muscles in your arms or legs from resistance exercises, your feet and soles will become strong in response to outside forces (rough surfaces) and stimulation from direct contact with the ground. As to a “barefoot type” shoe, in my opinion, the only reason anyone should ever wear such a shoe would be in situations where some type of shoe MUST be worn, such as required for employment. But as a substitute for going barefoot, I don’t recommend them, especially on relatively smooth pavement. Just go completely barefoot as much as you can, and your feet will soon get used to it. “Barefoot shoes” will just delay or prevent your feet from ever getting conditioned to the point of being comfortable completely barefoot. But since you asked, here is a site that does a pretty good job of explaining “barefoot shoes” criteria: https://primalhacker.com/blog/barefoot-shoes . Uncheck if you are not a robot. Note, comments are moderated and won't immediately appear.